Milan: Arnoldo Mondadori Editore, 1991. This is the first Italian edition of The Dark Wind. This novel is the fifth Tony Hillerman Navajo Mystery novel and the second appearance of Jim Chee as a main character. It was published in 1991 by Arnoldo Mondadori Editore in Milan, Italy. 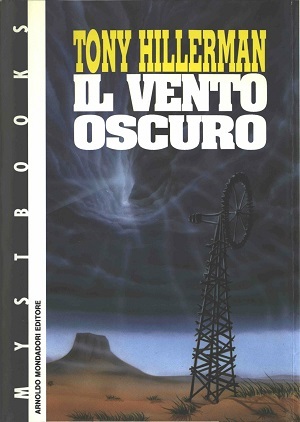 The text was translated from Tony Hillerman's original text in English to Italian by Stefano Negrini. The cover was designed by Staff Milano and illustrated by Paolo Rovedoni. The cover depicts a dark wind swirling around a darkening sky with a mesa in the background and a windmill in the foreground. The windmill is a key plot component. This book is technically a paperback, but it has a separate dustcover with fold-outs. Format: Paperback, 22.5 x 15.6 cm. Binding: Gray paper covers and the and author are printed vertically in white on the spine.